Athenian Sea Carriers Ltd. is an organization in which the safety of our people is a value which is not compromised, safety excellence is recognized as good business, leaders at all levels are safety role models, effective safety leadership is a prerequisite for promotion, people are aware of the hazards and risks in their workplace and act accordingly, compliance with safety standards and procedures is absolute, and repeat incidents are evidence of an out of control operation. 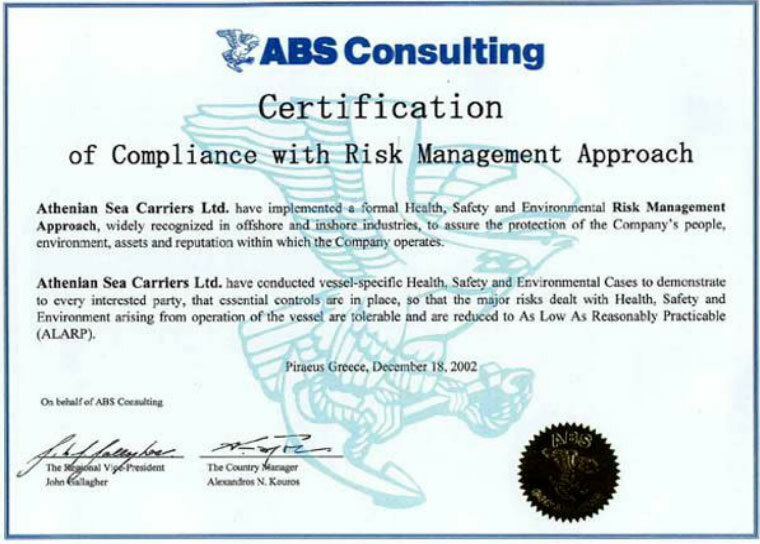 Athenian Sea Carriers Ltd. is the first shipping company that have implemented a formal Health, Safety and Environmental Risk Management Approach, widely recognized in offshore and inshore industries, to assure the protection of the Company's people, environment, assets and reputation within which the Company operates. Athenian Sea Carriers Ltd. have conducted vessel-specific Health, Safety and Environmental Cases to demonstrate to every interested party, that essential controls are in place, so that the major risk dealt with Health, Safety and Environment arising from operation of the vessel are tolerable and are reduced to As Low As Reasonably Practicable (ALARP). Risk Management Certification of Athenian Sea Carriers Ltd. was a result of the strong efforts of both shore-based personnel and vessels' crew as well as the contribution of ABS Consulting experts. ATHENIAN SEA CARRIERS LTD Ltd. takes pride in being amongst the first shipping companies to have achieved the ISO 9001 certification. The decision was based on its obligation under ship-management contracts to provide qualified crew and the choice of the scheme is intended to stress out the importance attached by the Company to having qualified crew on board its ships. The initial certification audit was successfully completed on the 16th of March 2000 by ABS. The scope of the ISO certification was defined as "Operation of oil tankers, and design, development and provision of training courses to seafarers"
Pursuing our Environmental Policy and awareness, ATHENIAN SEA CARRIERS proceeded with the application and the achievement of certification to the demanding ISO 14001 Environmental Management System standard, on September 2002. It covered all the ships in its fleet as well as the company's head office in Athens. The rigorous management system requirements were audited and certified by ABS Quality Evaluations. While presenting the certificate, ABS President Robert D. Somerville had said, "Only a very few ship owners in the world have achieved this standard. Action should focus on the source of pollution to the maximum possible extent. This process would not be possible without the commitment of our employees. Environment Program is part of our daily business, both at office and on board the ships." noted Christos Stathis, Chief Executive Officer of ATHENIAN. The efforts for further improving our Management System and thus better satisfying our increasing stakeholder needs, were being rewarded in 2007. This was the year that ATHENIAN achieved certification to the Health Safety, Quality and Environmental (HSQE) requirements of the ABS Guide for Marine Health Safety, Quality and Environmental Management. Certification took place on 11th of December 2007 and certificate was issued on 8th of September 2008. The HSQE Guide incorporates all the general management system principles embodied by the ISM Code, ISO 9001, ISO 14001 and OHSAS 18001. Thus, ATHENIAN SEA CARRIERS complies with the sound management systems principles reflected in the requirements of the International Safety Management (ISM) Code, Quality Management Systems (ISO 9001:2015), Environmental Management Systems (ISO 14001:2015) and Occupational Health & Safety Management Systems (OHSAS 18001:2007). As a tool for Self-Assessment. As a way to Benchmark with other organisations. As a guide to identify areas for Improvement. As the basis for a common Vocabulary and a way of thinking. As a Structure for the organisation's management system. Athenian's Sea Carries Ltd. Finance & Business Audit Division was assessed and granted the "Committed to Excellence in Europe" Award - 2004. 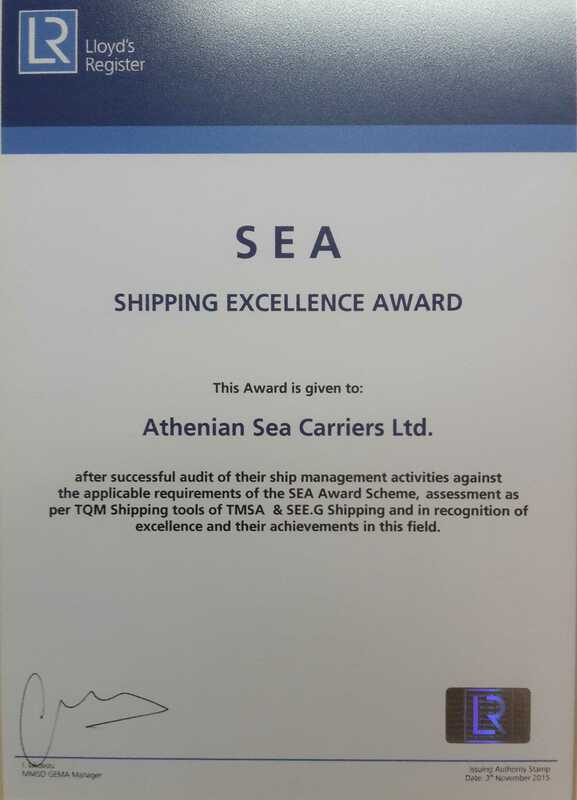 Athenian Sea Carriers Ltd. was assessed and granted the "Committed to Excellence in Europe" Award - 2005. Athenian Sea Carriers Ltd. was assessed and granted the "Recognized for Excellence (4 stars) in Europe" Award - 2007. 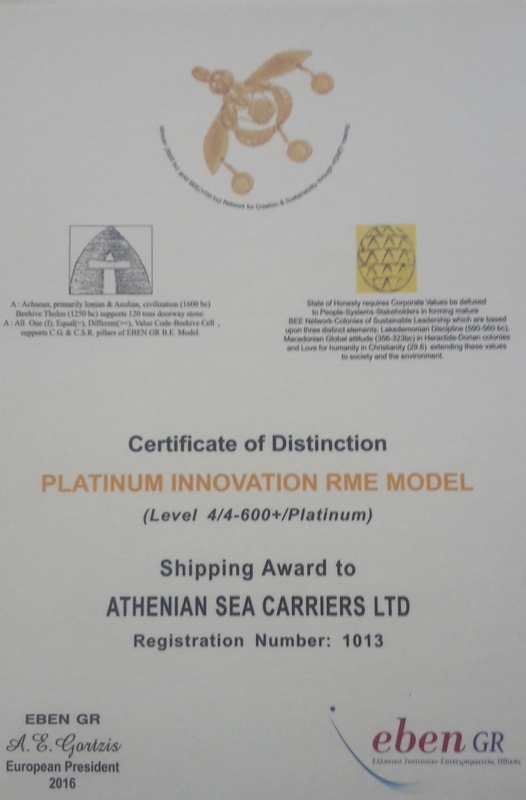 In 2008 Athenian Sea Carriers Ltd. was assessed and granted the "Recognized for Excellence (5 stars) in Europe" Award, which was renewed during 2011, 2013, 2015 & 2017. The EBEN GR Business Ethics Model is a fruitful effort of EBEN GR promoting business ethics excellence, through a business model with purpose of sustainable leadership. The model consists of three levels with their respective Bee (Business Ethics Excellence) Awards, granted after succeeding the HONEY assessment and incorporates methods and systems that contribute significantly to business success, targeting at sustainable business excellence. 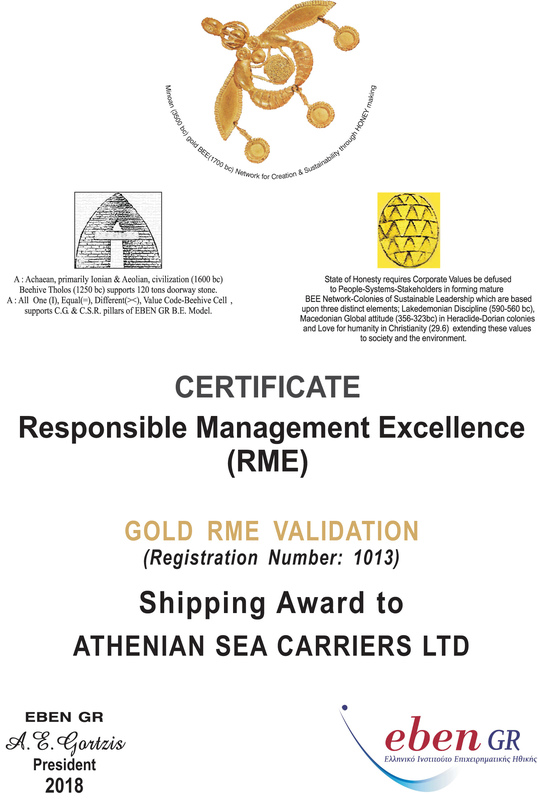 Athenian Sea Carriers has accomplished the Bronze (Good Will) BEE Award during 2007, Silver (Proven Support) BEE Award during 2008 and since 2009 the Gold (State of Honesty) in Auditing, Business Excellence and Environmental actions areas. Furthemore in 2016, Athenian has succeeded the Platinum Award at Vetting Procedures. In 2000, the U.S. Coast Guard developed an initiative to acknowledge the foreign flagged vessels that call in U.S. ports, whose careful safety management enables them to operate high-quality vessels safely, and to provide direct benefits to those vessels. This initiative is called QUALSHIP 21, quality shipping for the 21st century. To encourage quality vessel operations, the U.S. Coast Guard is providing a QUALSHIP 21 Certificate to all QUALSHIP 21 designated vessels, with a maximum two (2) year period of validity which corresponds to the vessel’s last U.S. Port State Control Safety and Protection Environmental Compliance exam. The actual benefit for tanker vessels is that the annual / mid-period examination of a QUALSHIP 21 tank vessel may be reduced in scope. Furtheremore we will be able to get waiver of USCG inspection for each vessel qualified as QUALSHIP 21. It should be highlighted that less than ten percent of foreign-flagged vessels operating in the United States meet the eligibility requirements of this program, thus putting the qualified vessels in an elite class. to the Qualship 21 status of USCG. BEST Scheme combines the excellence levels of three famous models: EBEN SEE.G, TMSA and EFQM. With BEST Scheme, everyone interested can be certified by all three models at the same time at a low cost and become widely identifiable not only in the shipping but in the whole business world. Within this framework, Athenian Sea Carriers shipping company has been awarded as a pioneer company as far business excellence in shipping is concerned since it has adopted all three models of total quality (TMSA-EBEN SEE.G-EFQM).